In week 7 last season the Seahawks came off a close win the previous week and played a division rival on Thursday Night Football. The Seahawks are now set for their déjà vu moment this season. 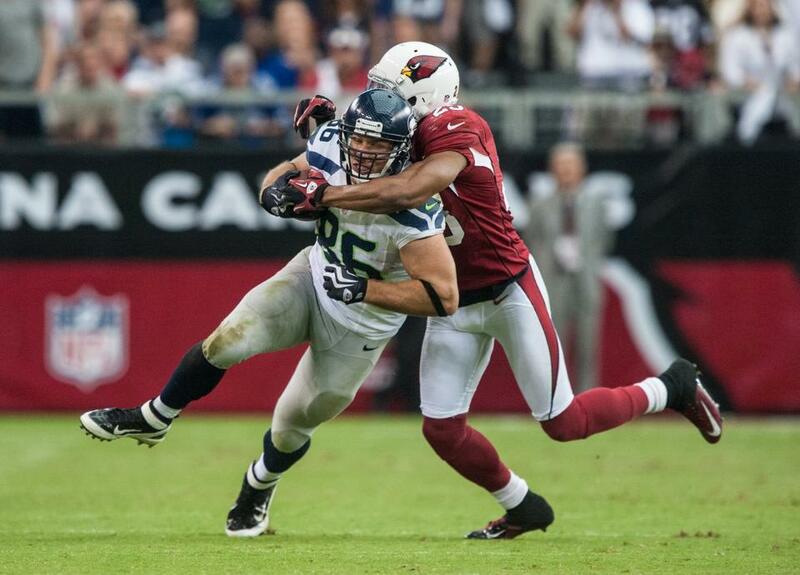 On Thursday night, the Seahawks will face their division rivals the Arizona Cardinals for the first time this season. The Seahawks are 5-1 and are coming off a 20-13 win last week over the Tennessee Titans. The Cardinals are tied for third place in the NFC West as they hold a 3-3 record. They are coming off a 32-20 loss to the San Francisco 49ers. The Cardinals lead the all-time series 15-13 but in their last meeting in December 2012, the Seahawks demolished Arizona 58-0 in the Seahawks most lopsided victory of all-time. Although the Cardinals currently hold a worse record than at this point last season, many including myself believe Arizona is a much improved team this year and this could be a significant challenge and this could potentially be a trap game for the Seahawks. Here is what I think we need to see out of the Seahawks this week in order to have a good chance of coming home victorious. There were a lot of things on offense last week that frustrated me. Upon reviewing the game film however, there were some aspects that are encouraging and are showing signs that our offense is indeed improving. Quarterback Russell Wilson did not have a flashy performance against the Titans but did manage to throw for 257 yards and record a passer rating of 98.5. He himself made no fundamental or mental mistakes including no turnovers. Over the past few weeks it seems to me that Wilson has not been as accurate on longer throws and because of that he has played more conservatively. This week I think it will be necessary for Wilson to get back to his 2012 self by confidently stretching the field. Facing a Cardinals defense that will try to take advantage of weakened offensive line, Wilson will be forced to make hurried throws. If the Seahawks offensive line can effective manage Arizona’s pass rush, Wilson could exploit the coverage of the Cardinals secondary. Look for Golden Tate to make a big impact and I think Jermaine Kearse’s height could make him a key contributor as well. Wilson has hit Kearse deep for touchdowns in two of the Seahawks first three road games. The biggest key to an all-around good game from the offense could be the return of tight end Zach Miller. Miller has been a valuable asset in both the passing game and the running game as a blocker. Miller has been sidelined the past two games with a hamstring injury. Surprisingly, without Miller this season the Seahawks average 45 more yards rushing per game than with him. The Seahawks offense also average about 1.5 sacks less without Miller than with him. Given these numbers the Seahawks are averaging 3.3 more points more with Miller than without him. Adding Miller back into the mix could definitely help the Seahawks move the ball better and Miller’s presence could lead to more scoring opportunities. If we can take advantage and score touchdowns instead of settling for field goals the Seahawks will be in great shape. There are three things on to keep an eye out for on defense this week. The first two are individual players. Defensive end Chris Clemons is unlikely to play this week after suffering a hyperextended elbow against Tennessee. If Clemons is out we are down to only three primary pass rushers. Bobby Wagner’s absence was also noticeable last week as the Seahawks used many different linebacker packages. Heath Farwell was who I expected to step in primarily for Wagner last week and he only recorded one tackle. Wagner was missed tremendously last week and I think it would be beneficial to limit the linebacker rotation to a small handful of players instead of the cornucopia of linebackers the Seahawks used against the Titans. With a smart veteran quarterback in Carson Palmer, the Cardinals may know how to exploit the Seahawks in the middle of the field more effectively than a Ryan Fitzpatrick if Wagner is not there to balance out our defense. Most importantly in my opinion, I will be looking at the Seahawks fourth quarter defense. After shutting the Houston Texans down in the fourth quarter and overtime three weeks ago the Seahawks have given up a long game-winning drive to the Indianapolis Colts and a 96-yard drive to the Titans last week which resulted in a field goal. Both of these drives came in the final 15 minutes of the game. If the game is close entering the final quarter of the game I will be extremely worried. The Cardinals were able to go down the field for a long game-winning scoring drive against us last year in Arizona and this year could spell the same fate with an improved Cardinals offense. The perfect way to avoid this is to run away with the game in the first three quarters. But what if the game is close? The Seahawks need to take it one play at a time and don’t panic every time Arizona moves the chains. Third downs will be very important and smart tackling could prevent disappointment. Do not go for the turnover, just focus on wrapping up the ball carrier. If we can force an Arizona turnover late in the game we will most likely win. Fundamental defense will be our biggest ally in these situations. Do not get fancy and play smart. Smart play and good fundamental execution will put us in good shape. The Arizona Cardinals feature a rather improved offense this year. A lot of this has to do with their new starting quarterback Carson Palmer. After 3 seasons with a rotating quarterback carousel, Palmer adds stability to a position and a team that has not made the playoffs since Kurt Warner led the Cardinals to back-to-back division titles in 2008 and 2009. The Cardinals do not boast an overly-impressive running game and it will be very tough to run on the Seahawks run defense. This makes the passing game my focus of the Arizona offense. Usually I like to pick an X-Factor player that flies under the radar but this week how can you not pick Cardinals wide receiver Larry Fitzgerald? Fitzgerald is the Cardinals leading receiver with 405 yards and 4 touchdowns. Fitzgerald will line up across from Richard Sherman this week and if there is one receiver who could give Sherman trouble it’s Fitzgerald. 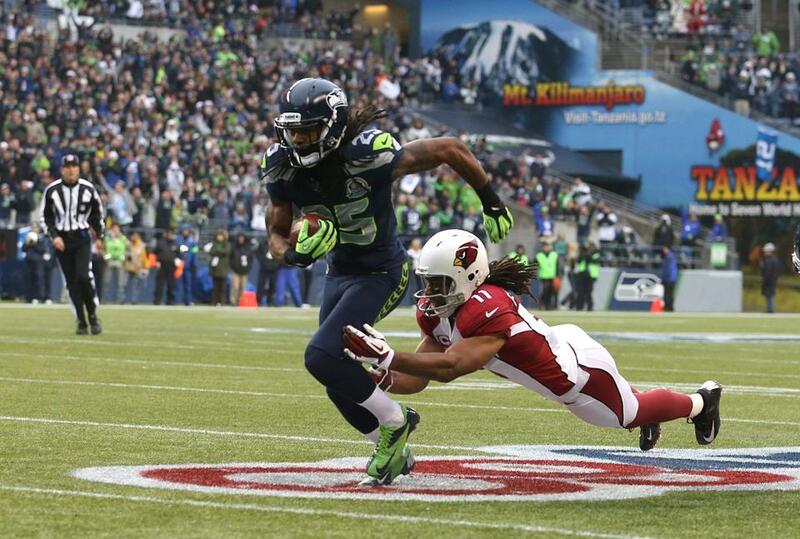 I expect Carson Palmer to test Sherman a lot on Thursday night by trying to get the ball to Fitzgerald. Look for the head coach Bruce Arians and offensive coordinator Harold Goodwin to build a game plan that will feature creative ways to get Fitzgerald open. Even though the Cardinals have gone 8-14 dating back to the start of last season, they feature one of the best defenses in the league. I think their defense is very underrated and they play extremely well at home. Patrick Peterson is one of the best cornerbacks in the league and the return of linebacker Karlos Dansby has added a dynamic tackler to the Cardinals linebacking corps. The Cardinals held Russell Wilson to 139 yards passing and also sacked Wilson 3 times in week one last season. There are two players on the Cardinals defense that are worthy of being X-Factor players to watch. Rookie cornerback Tyrann Mathieu has the second highest number of tackles on the Cardinals defense with 40 and his speed could present a problem for the Seahawks receivers. The best pass rusher the Cardinals have is defensive end Darnell Dockett who has 4 sacks this season. Dockett had a big impact when the Seahawks played in Arizona last season and it will be crucial to double team Dockett to prevent Russell Wilson from getting knocked down. Random Thoughts: The Seahawks will most likely wear white jerseys this week. No word on pant color yet… Brad Nessler and Mike Mayock have the call for NFL Network this week. After discussing broadcasters and analysts with a couple of friends last week, I came to the conclusion that Mayock is my favorite analyst on any network. He knows the game of football very well, knows the talent on the field being an NFL Draft expert, and can be critical of players; something you oftentimes do not see on a television broadcast. *Cough, Jon Gruden, cough. *… NFL Network features a 2-hour pregame show as well as live look-ins all day on their weekday shows. I look forward to Rich Eisen’s comedy, Kurt Warner’s Arizona bias, and Deion Sanders’ ridiculousness on TV this week… For those of you who do not know who Priyanka Chopra is you are going to find out right before Thursday’s game. Her single “In My City” is the theme song for Thursday Night Football and not only is it a catchy song, she is also a stone-cold fox… Why does it seem like the Seahawks never get to play at home for Thursday Night Football? Since TNF started in 2006 the Seahawks have only played a TNF game at home twice… The crowd at University of Phoenix Stadium is the loudest I have heard on any of my road trips. Add in the fact that Thursday’s game has been announced a sellout and that it is in primetime, the Seahawks may have trouble at the line of scrimmage this week. Hopefully not though… If the Seahawks can pull out a victory they will head into a mini-bye week before week 8 against the St. Louis Rams with a 6-1 record!… To anyone who is going to Thursday’s game and Saturday’s UW game at Arizona State, I am extremely jealous (that means you, Dad). Prediction: Rushing yards will come at a premium this week for both teams. I think the Seahawks will struggle mightily at times on Thursday night. The Seahawks will ride a roller coaster consisting of solid plays and frustrating plays. The Cardinals will be able to move the ball effectively but I think Carson Palmer will throw at least two interceptions this week. After giving up a field goal to make it 21-19 Arizona, the Seahawks will successfully drive down the field and Steven Hauschka will kick a game-winning field goal with mere seconds remaining. The Seahawks will barely escape with a 6-1 record and will hold a 1.5 game lead on the rest of the NFC West heading into Sunday’s games. Check back on Friday for my review of Thursday Night Football. Go Seahawks! The Seahawks return after their bye week this week as they head to South Beach to face the Miami Dolphins. This is the first of six games to conclude the regular season for the Seahawks and the first of three road games. The Seahawks head into this game with a 6-4 record, clinging onto an NFC wild-card spot while they are trying to make up ground in the NFC West. The Miami Dolphins come into this game with a 4-6 record and they have lost their last three games. With a win, the Dolphins could get back into AFC wild-card contention. The Dolphins have a 9-4 all-time advantage against the Seahawks. 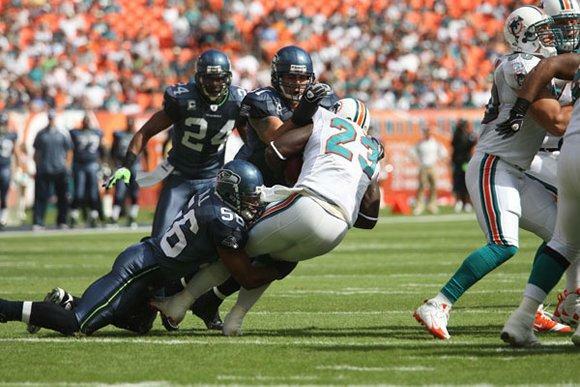 In their last meeting in 2008, the Dolphins held on to beat Seattle 21-19 in Miami. The Dolphins and their newly schemed wildcat offense went on to win the AFC East that year while the Seahawks finished the season 4-12. There will be plenty to be looking for out of the Seahawks coming off the bye. Here is what I am looking for. The number one thing I will be looking for out of the Seahawks this week is continually building offensive momentum on the road. The Dolphins are ranked 9th in the NFL in rushing yards allowed, meaning Marshawn Lynch may have trouble getting going this week. On the other hand, Miami is ranked 27th in pass yards allowed. The last time the Seahawks played on the road was in Detroit four weeks ago. In that game Russell Wilson showed significant improvement passing. After two home games and an extra week of preparation, I am hoping Wilson can play another decent game this week. I do expect to see some rust being shaken off early but I do not expect it to last for an extended period of play. A good game from Wilson this week includes minimal turnovers. Wilson has made several mistakes on the road this year in terms of errant passes. If he is relaxed and does not force throws like he has in the past, I do not see a problem with the way our offense plays. On defense, the biggest problem facing the Seahawks on the road is stopping the opposition on third down. In Detroit, the Lions were successful on third down conversions about 75 percent of the time. In order to stop Ryan Tannehill and the Dolphins from moving the chains, pressure will be the main key for the Seahawks defense. Being an inexperienced rookie quarterback, Tannehill has made several mistakes over the past couple of weeks. He has thrown five interceptions in his last two games and only one touchdown. This week the Seahawks will have Jason Jones back along the inside and K.J. Wright will also be back after sitting out the Jets game with an injury. I think Chris Clemons will be the defensive player of the game for the Seahawks this week with a pair of sacks. I think four or five sacks by the defense will get the job done and Tannehill and the Dolphins will make a couple of crucial mistakes because of the pressure. The Seahawks secondary is a group I definitely will be looking at this week. Brandon Browner will line up against Brian Hartline this week and Richard Sherman will line up with Davone Bess but keep a look out for how Seattle uses cornerback Walter Thurmond. The injury-prone Thurmond will be playing his first game this season after recovering from a broken leg which he suffered in a game against Cleveland last season. Thurmond may be used in nickel packages and may see some time in the slot. Thurmond will get a fair amount of playing time and I will be looking at his speed. Before his broken leg Thurmond was one of the fastest players on defense. If he is covering Bess or even going after Reggie Bush should the opportunity present itself, it will be fascinating to see how well Thurmond can keep up. In all honestly to the common fan, the Miami Dolphins may be one of the most boring teams in the National Football League. The Dolphins were featured on the HBO series “Hard Knocks” during training camp and the preseason and did not give the audience the flare that the series has given in past years. The Dolphins and first year head coach Joe Philbin have done a good job in putting together a good mix of young and old talent and have proven that they can win games; they are not the pushover a lot of fans predicted them to be at the start of the season. The biggest weapon on offense for the Dolphins is running back Reggie Bush. Bush has the capability to make explosive plays if he can get out in the open. The Seahawks need to do a good job of making contact with Bush in order to slow him down. On defense, Cameron Wake continues to be one of the premier pass rushers in the league. He has 9.5 sacks so far on the season and will most likely make the pro bowl once again this season. One guy to keep an eye on this week is outside linebacker Kevin Burnett. Burnett is tied for second on the team in tackles with 44 and with Karlos Dansby dominating in the middle, positive plays to the left may come at a premium for the Seahawks this week. Random Thoughts: The Dolphins have a home-field advantage that is continually swept under the rug; the weather. Game-time weather conditions are usually hot and humid. This week the high is supposed to be in the mid 70’s so weather hopefully is not a big issue… The Seahawks will most likely wear blue jerseys this week as the Dolphins will wear white. I hope the Seahawks debut the white pants this week… All of our remaining road games are 10am starts. Ouch… It’s too bad I didn’t make this game our road trip this year. I would not mind sipping on an ice cold beer while lying on the beach… Chris Myers and Tim Ryan have the call once again on FOX this week. Oh joy!… Ryan Tannehill’s wife Lauren is smoking hot. Just saying… My friend James is coming over for the game this week. Super excited since he hasn’t been over for a game yet this season… McDonald’s breakfast may be a must this week before the game… It feels good to be back on the blog after this nice break! Prediction: I feel that a lot of my friends are expecting the Seahawks to win rather easily. I think this game could be a bit sloppy. It is always hard to win on the road and the Seahawks have proven this, only winning one game on the road so far this season. We are catching the Dolphins at just the right time, as they are starting to slip away from playoff contention. I think the Seahawks will win but it will be a lot closer than most people think. Stay tuned for my review of the Dolphins game on Monday afternoon. Thanks everybody. It is good to be back writing. Go Seahawks!